This superb 10-disc set from EMI Classics covers the whole of Menuhin’s solo career and provides a wonderful overview of his breadth of repertoire, including some classic recordings of composers ranging from Vivaldi through to Walton. Disc 1 presents us with cogently argued recordings of Vivaldi’s Four Seasons from 1979 - with Alberto Lysy directing the Camerata Lysy Gstaad - and Violin Concertos numbers 5, 6, 8 and Il Sospetto - Jerzy Maksymiuk conducts the Polish Chamber orchestra in 1982. The solo line is muscular and purposeful, with some lovely delicate touches, and the Four Seasons in particular are energetic, full of vitality and well articulated. The next disc contains Bach Violin concertos in A minor (BWV1041) and E major (BWV1042) – both 1958; the double concerto in D minor (BWV1043, with Christian Ferras in 1959), and the Triple Concerto in A minor (BWV1044) in 1965, where he is joined by William Bennett on the flute and George Malcolm on harpsichord. There are some exquisite slow movements here – sensitive and incredibly tender. The pieces are well-phrased, spacious, unhurried and sweet-toned. Menuhin directs his own Bath Festival Orchestra from the violin – as also on the next disc of Haydn’s Violin Concerto in C and Mozart Concertos 4 and 5. The Haydn is given a fresh and engaging performance (1963) and the Mozarts (from 1962 and 1961) are elegant and expressive, with some wonderful sweetness of playing and an exciting last movement to the Fifth Concerto. On the fourth disc Silvestri conducts the Wiener Philharmoniker – this is one of many recordings Menuhin made of the Beethoven concerto, but is a particularly fine one, dating from 1960, in which we find grand statements from the Wiener Philharmoniker and a rich and warm tone from Menuhin. It is full of energy, life and spirit, with the serious first movement full of gravitas and a lovely dancing quality in the third movement. It is followed by the Mendelssohn concerto with Efrem Kurtz and the Philharmonia (1959) - another robust performance, with strong, confident accompaniment from the orchestra and a beautifully sensitive and lyrical performance by Menuhin. The slow movement, although sweet-toned, is not indulgent, but is given a surprisingly straight and unemotional rendition. It is succeeded by a fiery finale. Lalo opens disc 5 – a bold and assured performance of the Symphonie Espagnole with his teacher Enescu conducting the Orchestre Symphonique de Paris in 1933. Menuhin was the second person to record the Lalo in full (other violinists omitted the Intermezzo), and the violin sound is pretty good for the age of recording - although the orchestra is a bit boxy and restricted. 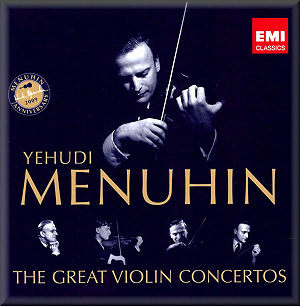 Menuhin is here vivacious and expressive in a secure and idiomatic performance, with a good, light touch, particularly in the first movement. The ensuing Chausson Poème, with the same orchestra, conductor and date is also excellent, and the Dvorák Violin Concerto closes the disc with a recording dating from 1936 with the Orchestre de la Société des Concerts du Conservatoire, in which the sound is a little compromised but the performance is first class. Disc 6 features the Brahms Concerto with the Berlin Philharmoniker and Rudolf Kempe – the work is given a rather slow and ponderous opening and the sound is a little thin (1957), yet there is a beautifully tender slow movement and Menuhin is wonderfully lithe in the third movement. The Bruch violin concerto follows, with Walter Susskind conducting the Philharmonia in 1956 – a noble and expansive first movement: energetic, full of spirit and passion; a majestic and mellifluous second movement and a supple and vigorous finale. The famous recording of Elgar conducting the London Symphony Orchestra in his Violin Concerto with a highly accomplished young Menuhin in 1932 opens disc 7. It is a remarkably mature recording on Menuhin’s part (who is the youngest violinist to have recorded the piece), with secure intonation and a tremendous amount of musicality and insight from the soloist who, although very polished and sensitive is nonetheless slightly unemotional. The performance - notoriously done on minimum rehearsal time, and the only complete and electrical recording Elgar made of the work - is fairly hard-driven at times, with a stirring, urgent, serious first movement. A 1935 performance of the Mozart third Violin Concerto with Enescu again and the Orchestre Symphonique de Paris completes the disc – an incisive and assured version with a very tender slow movement. The ensuing disc opens with a nice rendition of the Tchaikovsky Sérénade Mélancolique with Boult and the London Philharmonic Orchestra in 1959. The same conductor and orchestra also feature in the following Sibelius Concerto, dating from 1955. Menuhin attacks the opening of this piece with some aggression, rather than taking an introspective and meditative attitude, although the mood does gradually change to one more lyrical. The whole work is rather hard-driven, with an excellent second movement - committed and intense, and a tense and exhilarating third movement. Mögens Woldike conducts the Danish State Radio Symphony Orchestra in a virtuosic and compelling performance of the Nielsen Violin concerto (1952), which concludes the disc. The penultimate CD in the set contains the first Rhapsody and two Violin Concertos by Bartók, with Boulez conducting the BBC Symphony Orchestra in 1968 in the Rhapsody and Dorati the New Philharmonic Orchestra in the concertos (1965-6). The works are given powerful performances with particularly luminescent playing from Menuhin. The final disc commences with the Berg Concerto, recorded in 1968 with Pierre Boulez and the BBC Symphony Orchestra – a rather detached and unemotional performance of this. It is followed by the Walton Violin Concerto, conducted by the composer with the London Symphony Orchestra in 1969, in an eloquent performance that gets to the heart of the work, particularly in the last movement. It is well accompanied by the LSO who, having had Previn at the helm for several years, were well attuned to the Walton idiom. The interplay between the soloist and the orchestra is an essential component of Walton’s score but here I felt that the balance favoured the soloist too much so that some of the orchestral instruments are possibly not as audible as they should be. However, the recapitulation of the main melody in the third movement is ravishingly played and gorgeously accompanied here, and is really the highlight of the recording. The set concludes with Bartók’s Second Rhapsody - a composer Menuhin had something of a rapport with, and from whom he commissioned a sonata - with Boulez and the BBC Symphony Orchestra in 1968 again. The work contains rather curious hints of Scottish folk music as well as a strong Hungarian flavour and is here given an inspired and lively, fluent performance. This is a superb set, not just for those who love Menuhin’s playing, but for any who love the beautiful sounds that the violin can make, or are interested in historic recordings. On the latter point it must be remembered that some recordings date from the very early days of electrical recording technology and thus some adjustment must be made for the quality of the sound. Overall, though, this set clearly shows a great violinist at his best who, despite the fact that his repertoire embraced all periods and styles, was always able to bring an individuality and insight to his performances over an impressive period encompassing nearly half a century.